POWAY, CA--(Marketwired - Jan 24, 2017) - Apricorn, the leading manufacturer of software-free, hardware-encrypted USB drives, today announced the release of the Aegis Secure Key 3z hardware encrypted flash drive (patent pending) and the Aegis Configurator (patent pending). 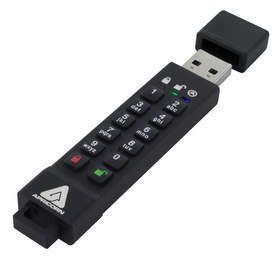 Building on the success of its predecessor (the Aegis Secure Key 3.0), the Aegis Secure Key 3z is a feature-rich USB drive that includes FIPS-level security while eliminating vulnerabilities found in software-managed systems. It also enables security professionals in the most regulated industries -- such as banking, government, education, legal and healthcare -- to configure and deploy multiple devices simultaneously with the new Aegis Configurator. Offering the most advanced data protection, the new Aegis Secure Key 3z flash drive offers top-level security innovation (FIPS 140-2 level 3 validation pending) at lower costs and smaller form factor than available before. Combined with the Aegis Configurator, the Aegis Secure Key 3z flash drive provides a seamless workflow for secure storage rollouts. This includes an ability to shut down the configuration pathway via firmware residing on the device, eliminating the ability to reopen the pathway via software. This "locking the door from the inside" approach eliminates the threat of unauthorized access to the device's authentication settings via the USB port. The Aegis Configurator is Apricorn's accompanying Windows-based software package that allows 10 or more compatible Aegis Secure Devices to be set up and configured simultaneously. Beyond being exponentially faster than configuring an Apricorn device by hand, the configurator also introduces a host of new features. Automatic random PIN generation, programmable maximum PIN length, master profile creation and storage, and the ability to reformat and pre-load data onto drives at the time of configuration are just a few of the new tools introduced in the configurator launch. 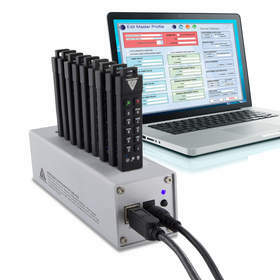 The Aegis Secure Key 3z is Apricorn's most feature-rich device to date and (like all Apricorn secure drives) is software-free, eliminating annual license fees, software updates, and platform compatibility issues. The Aegis Secure Key 3z is available immediately in a variety of sizes, including: 8GB ($79), 16GB ($99), 32GB ($129), and 64GB ($159). It is available from most online retailers and at www.apricorn.com. Headquartered in Poway, California, Apricorn provides secure storage innovations to the most prominent companies in the categories of finance, healthcare, education, and government throughout North America, Canada and EMEA. Apricorn products have become the standard for myriad data security strategies worldwide. Founded in 1983, numerous award-winning products have been developed under the Apricorn brand as well as for a number of leading computer manufacturers on an OEM basis.